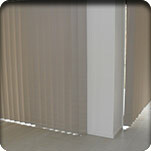 All our Vertical Blinds are made to measure. Call us for professional advice on the ultimate ideas to maximize the potential of your home. 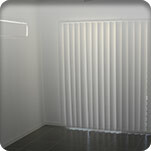 Vertical Blinds are one of the most economical window covering available. 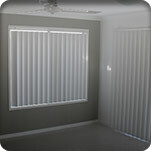 Vertical blinds can be used over any sized window or sliding door. Our customers have the option of chain control or wand feature allowing various amounts of light into the room. The vertical tracking system is manufactured using Uniline’s slimline, Australian made tracks, carriers and metal spacers. Now offering the choice of chained or chainless weights at the bottom. 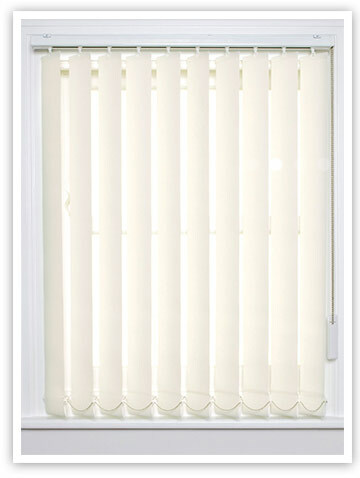 Ask about our ‘Budget’ range of verticals. Budget in price not quality! One of our manufacturers has bulk supply of quality material in 20 modern and classic colours, allowing us to pass the savings on to you!